Can you crack Da Vinci’s vault? Marvel at the stunning graphic work of art that is this new game at Fly Casino. 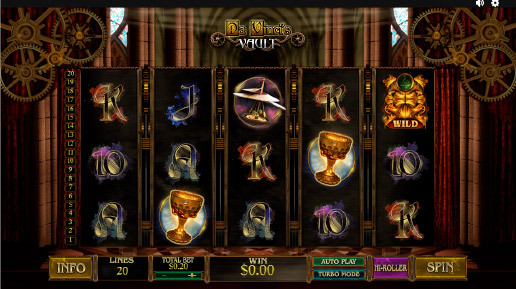 Da Vinci’s Vault online slot is a 5-reel, 20-line game that is filled with amazing game play and bonus features! Much like the man himself was a tad mad, our game creators at Playtech have pushed the boundaries with this latest slot game. This is a great bonus feature that really enhances your amounts of winnings. When three or more scatter symbols land anywhere, you’ll trigger the free spins round. This is different from any other bonus feature you’ll encounter as the free spins are unlimited! Two extra wild symbols are added to the reels, the round only ends when you collect 3 skull symbols. So, you could potentially have 100’s free spins (unlikely, but possible) until that third skull symbol appears. Triple Play Sunday! On Sunday from 00:00GMT until 23:59 GMT, all members on their first deposit of just $/£/€30 or more will receive a 75% bonus up to $/£/€75 bonus. Claim 3X! $25’s Galore Slots Bonuses! From 00:00GMT until 23:59 GMT, all members on their deposit of $/£/€25 or more will receive a $/£/€25.00 bonus. Claim it 5X! $266.00 BIG TUESDAY! From 00:00GMT until 23:59 GMT, all members on their deposit of $/£/€30 or more will receive a 133% bonus up to $266.00 bonus.